List of Passers: ARMM March 2018 Civil Service Exam Results - Balita Boss! 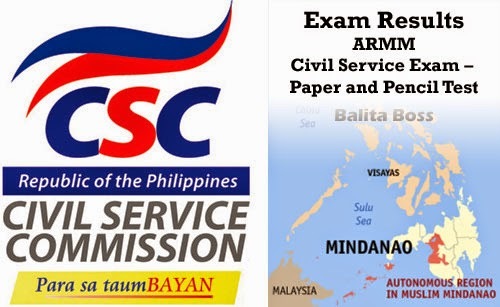 The Civil Service Commission (CSC) released Wednesday, May 16 the results of the March 2018 Civil Service Exam – Paper and Pencil Test (CSE-PPT) for Autonomous Region in Muslim Mindanao (ARMM). CSC announced that a total of 69 examinees for professional level and 5 examinees for sub-professional level successfully passed the Civil Service Exam in ARMM. Complete alphabetical list of passers from ARMM who got at least 80% average grade for professional and sub-professional levels are listed below.